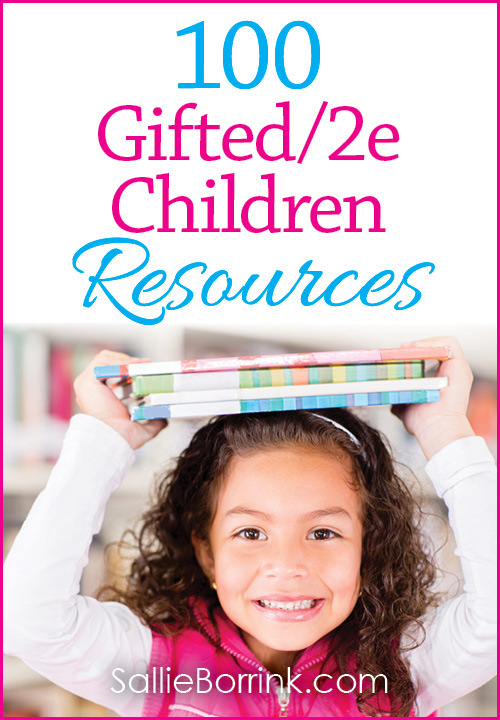 Home ▹ Gifted & 2e ▹ Should I Have My Gifted Child Tested? 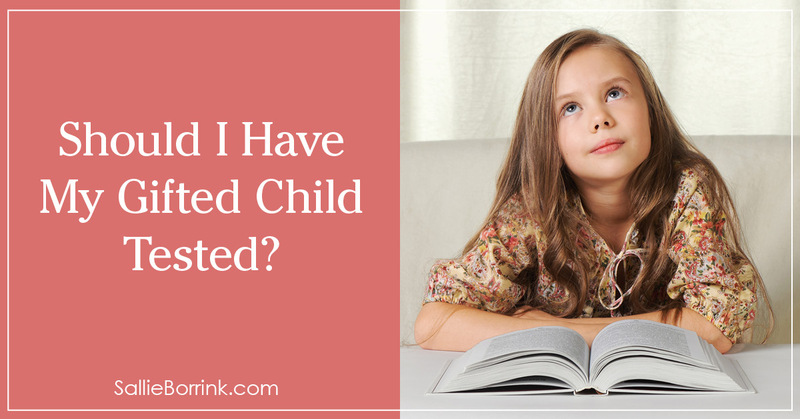 Should I Have My Gifted Child Tested? There are many reasons why a parent might want to have their gifted child tested. I’m going to focus on the primary reasons we chose to pay for professional testing and the outcomes. Parts of this might seem a bit cryptic and I don’t mean to be that way. But I am going to protect my child’s privacy and not divulge numerous details (as interesting as they were for us and as much as I’d love to share them and discuss them). But I am going to be quite open about my own experience as the mother of a gifted child and how this played a role in deciding to test. In many ways, this question of trying to understand and parent my child has impacted every aspect of my life – personal, relational, professional, financial, and spiritual. I didn’t know it was giftedness from the start. 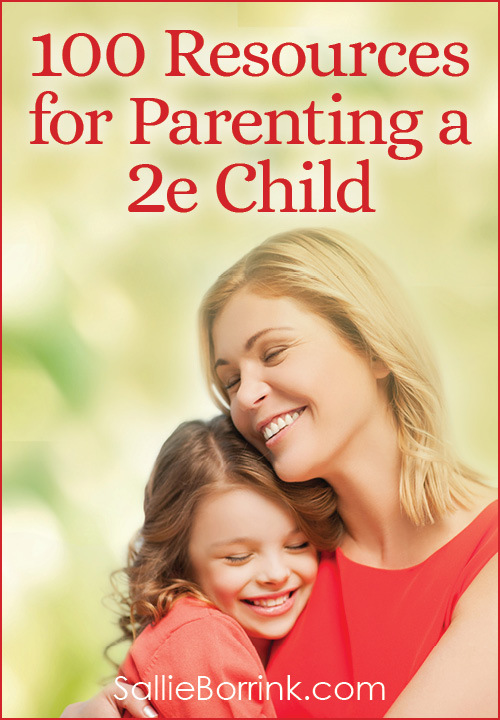 But if you go through this site, you’ll see all the steps along the way through the years as I tried to understand my child and shared what I learned in an effort to help others – high need baby, spirited child, right-brained, gifted, 2e, etc. So many things would fit and make sense to a point and yet I could never pull it all together into a coherent whole. The only thing that made sense overall was twice-exceptional (2e), but I had no way of knowing that definitely without professional testing. Why Did We Have Our Gifted Child Tested? All three of us wanted to truly know how Caroline is wired. We needed to know as her parents, especially as homeschoolers responsible for her entire education. She wanted to know since she doesn’t think and work the way most kids around her do. She wanted to understand herself better. I can honestly say that it really didn’t matter to me if I had a gifted child. The only concern I had about that had to do with the work I’ve done here. I said to David, “What if she’s not gifted/2e and I’ve written all this gifted/2e stuff on my website? I’m going to look like an idiot.” So that was honestly my only concern about possibly discovering she wasn’t gifted. I didn’t need a gifted child to validate me as a mother. We were also motivated by the fact that if she is twice-exceptional (2e) that she would get the learning accommodations she might need in the future (such as during SAT or ACT testing if she goes that route). This also mattered a lot to Caroline. I was convinced as far as I could ascertain that she was 2e, and I made sure the doctor we saw was well-acquainted with the challenges of testing 2e kids in case I was right. had our parents-only meeting with the doctor where we got the results. Caroline is twice-exceptional with a really unique grouping of strengths and weaknesses. The doctor told us that while she was testing Caroline she would expect one thing to happen and something else would. In the end, she has a unique profile – even for a gifted kid. Do you have any idea how it felt as a mom to hear that after struggling for literally years to figure out what makes your child tick? Just sitting here typing this I have tears in my eyes because it has been so challenging. Not because she’s a terrible kid. She’s a great kid – kind, thoughtful, funny, creative, imaginative… I could go on and on with all the ways she is great. But dear Lord. Trying to parent and homeschool her has been hard. I mean really hard. So why did I say I learned I’m not crazy? Because if I had to say I felt one thing after we got the results back it was vindicated. That might seem like a strange word to choose, but that’s exactly how I felt. As the doctor was going over the results and she ticked off thing after thing I had figured out through endless hours of reading and research and observation over the years, I felt so proud of myself. I felt like a good mom. And that isn’t a feeling I’ve often felt. When you try so hard to figure out what your child needs and it just never all comes together and makes sense, it’s easy to feel like a failure. On the one hand, I knew I was a good mom because I was trying so hard for my child. But on the other hand, what kind of a mother can’t figure out how to effectively homeschool her child? No matter what I tried, nothing worked really well. For example, why is it all these other parents can do these amazing things with their kids and I can’t even figure out how to teach her math? (Now I know there’s a reason for that.) Why is it we can’t even attend church as a family? (Now I know there’s a reason for that, too.) For every significant struggle we’ve had, there was a clear reason. It wasn’t in our head. And it wasn’t us being permissive parents. I didn’t figure out everything and there were a few things that surprised me. But for a lay person with no training in gifted children, I was really proud of how much I did figure out. I was humbled by the fact that we (as her parents) had made so many RIGHT choices for her starting during her infancy which was not textbook in any way. We have prayed so fervently for wisdom and discernment. And God answered those prayers, even when we weren’t completely sure we were doing the right thing. Whether it was changing our mind about spanking or rethinking everything about raising a gifted child in the Christian faith or what it means to disciple a child in Christ outside the box, God was guiding us to make the best choices for her – even when others clearly did not agree with our decisions. Not only did we make the right choices and accommodations for her, we could have done even more in a few places. I also finally felt like a good mom because we’ve dealt with so much second-guessing of our parenting from people around us. We have experienced a distinct lack of support in our real life circumstances with parenting. If you take every negative stereotype you can come up with related to these, we’ve dealt with it. We’ve put up with a lot of crap from other people. Insensitive comments. Talking behind our backs. People being upset with choices we felt compelled to make in her best interest. Skepticism. And on and on. The reality is that people downplayed our struggles to the point we stopped talking about them with almost everyone except a very few we trusted. People thought we were helicopter parents. People thought we were too wrapped up in our child. People thought we were exaggerating. Eventually you realize people really don’t want to make the effort to take you seriously and it’s too painful to keep trying. I now know exactly what is going on with my child. No more second guessing myself because maybe I really am a crazy parent who is way too wrapped up in her only child. If people want to be stupid about it, I can now tell them we’ve had professional testing done and this is what we know for a fact so they can please shut up about second guessing our decisions. That alone is worth all the money we spent. There are these memes and articles that go around about how all kids are gifted that imply it’s wrong to think your “gifted” child is somehow different than every other kid. (No, every kid isn’t gifted in this way.) Or these articles that are hostile to the idea of gifted kids and the special services they require when “smart kids” don’t need or deserve any extra help. (Yes, they do!) What these people don’t understand is that having a gifted child can be unbelievably hard at times. Being gifted (and especially 2e) doesn’t mean you are smart and cruise easily through school. It’s not anything like that for most gifted kids who are asynchronous to the point they don’t fit in. And most people simply don’t grasp this. They have NO IDEA what a daily challenge it is in the most mundane areas to have a child who doesn’t fit the norm. They have NO IDEA what it is like to realize that homeschooling is the ONLY option for your child because she would never thrive in a traditional classroom. They have NO IDEA how many families with a gifted child are forced to give up one income or a beloved career because someone has to be home to homeschool their child. People have NO IDEA the challenges associated with parenting a kid like this and it makes it even worse when we are ostracized for expressing our concerns, worries, and frustrations. So was gifted testing worth it? Do I recommend it for others? Yes, ESPECIALLY if you have any inkling at all that your child is twice-exceptional. The 2e component is so difficult to figure out on your own. Our testing revealed one conclusion I had come to where I was totally correct on half of it and totally wrong on the other half. I could never have figured that out on my own. I do have one word for parents who might not be able to easily afford testing. I know there are people who can sit down and write a check for testing and not think twice about it. But for many of us, it is a significant financial decision. Because, yes, having a gifted/2e child also impacts your bottom line in many ways. 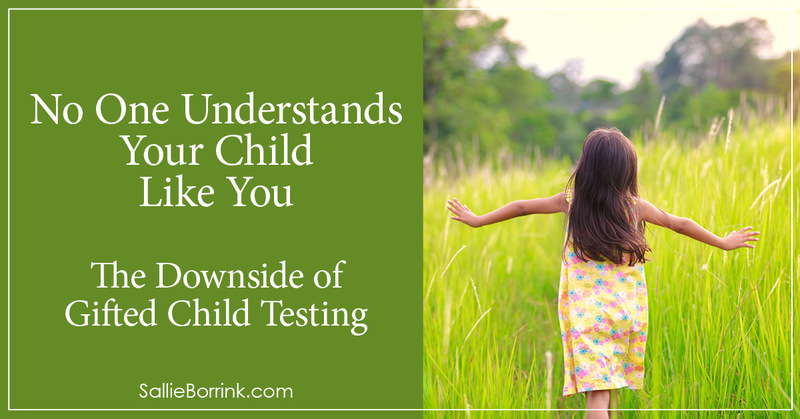 And if you discover through the testing that your child needs therapy, then the expense is even greater. It can be a significant amount of money, but I truly think it is some of the best money you can spend. There really isn’t a price you can put on understanding your child and making sure your child understands herself. We now have answers that we can carry with us for years that will help us make decisions about all kinds of things. That is worth more than just about anything else you could spend money on. And take it from me, there is no price you can put on knowing you are right in what you are doing for your child. The peace of mind I now have in knowing that we are on the right path is significant. Yes, we still have challenges ahead. But I have NO DOUBTS now that we are on the right path. And that is worth so much. 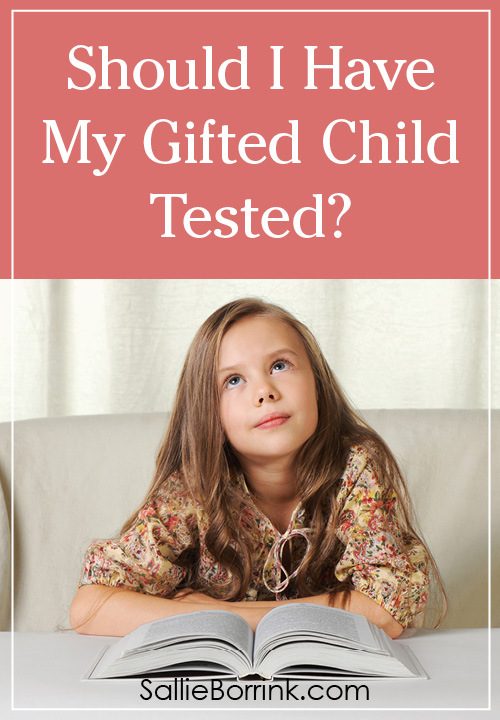 I truly hope this update will help others as they are asking themselves “should I have my gifted child tested?” I know it isn’t an easy question. But if your experience is anything like ours, I think you will be glad you did. Thank you for this. A friend of mine recently had her oldest son (she has 2) tested because of his obvious (to mom and dad!) giftedness and struggles. Testing validated everything they had seen as well and gave them a plan to give to the private school, because currently my friend is too sick to homeschool. She said the same: worth every penny and hey! guess what? She isn’t crazy in what she saw in her child. Thank you for this Sallie! I’ve been on the fence about testing…. time to rethink it. I’m very glad that you have found validation for your parenting and homeschooling through the testing!!! I think that with your personality type, that was maybe something you really needed. Most people can follow the norm and be just fine, but there are some that God leads on other paths, or just straight through the brush. What kind of doctor did you have do the testing? God bless you and your family. Your openness about struggling to find the right fit for your child has helped me considerably. I can identify with being an older parent of an only, gifted child who has some issues that has labeled them as “difficult”. As a fellow introvert, I need this site and others to help me come to terms with my child’s giftedness. I learned not to share with my parents, even. Husband and I are considering testing because even a grade skip hasn’t solved our child’s educational needs, and the teacher is complaining about the gap in maturity. Homeschooling is our last choice since our child is also an only and needs kids (being much more social than mom), and I really don’t want to join any clubs. A neuropsychologist did the testing. We specifically looked for a practice that was very familiar with kids, giftedness, and 2e issues. I apologize it has taken me weeks to respond to your comment. I’m glad you found this post encouraging. I can understand homeschooling being the last choice. I think it is that way for many parents. I think once 2e enters the picture it often becomes the only viable option unless you are fortunate enough to live near an extraordinary public or private school that can meet those unique needs. Most don’t have any idea what to do with these kinds of kids.